The UV BigBoy™ Series is the most versatile commercial ultraviolet disinfection system on the market today.This 15 to 60 GPM series is manufactured with versatility in mind, and is virtually unlimited in the possible filter configurations and manifold sequences. The series is designed with the same traditional style that Pura has made an industry standard - worldwide. One advantage of the UV BigBoy™Series is the convenient manifold mounting rack. The rack can be used to configure up to four UV chambers in parallel or in series. 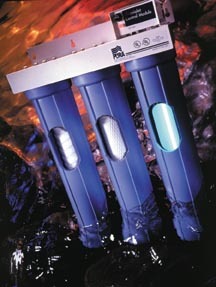 This allows the user to achieve either a higher UV dosage or higher flow rate (up to 60 GPM). This mounting rack configuration provides easy access for cleaning and maintenance to the individual units without the need to shut down the entire water distribution line. The standard LED lamp monitor provides a visual verification the lamp is in operation. The UV BigBoy™ Series, with its capacity, versatility and cost, to be the world's most flexible, complete water disinfection system in its class.